We may not have needed another revival of Singin’ in the Rain, but slick, glossy, intelligent productions of this scale are always a welcome sight. 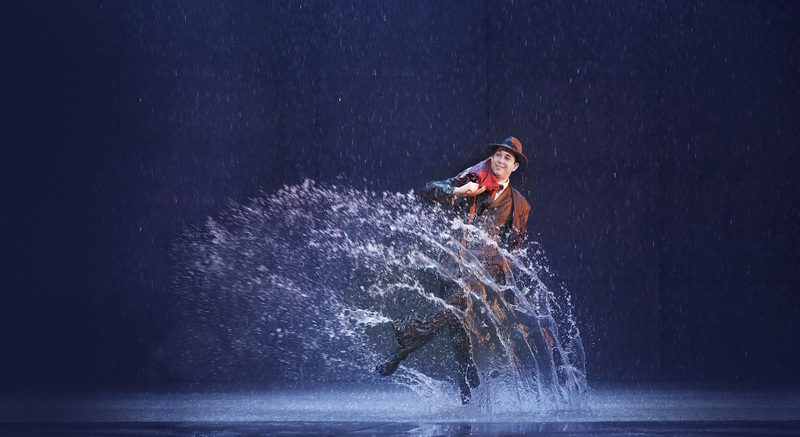 One of the all-time most popular movie musicals, Singin’ in the Rain has proved challenging to adapt for the stage due to the multitude of scenes and lack of chorus work. Director Jonathan Church has solved both of these issues, successfully presenting the show as a cohesive stage musical rather than an attempt to recreate a movie on stage. A prolific director and commissioner of musicals in his time as artistic director at Chichester Festival Theatre, Church’s first musical at Sydney Theatre Company is highly anticipated. The action is all set on a giant movie studio sound stage, which nimbly changes for various scenes with a bench here, a desk there. 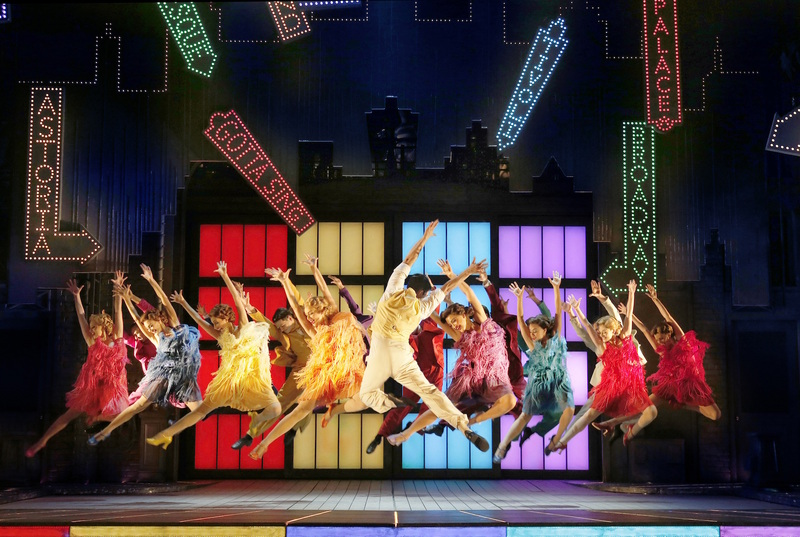 Simon Higlett’s design maintains a detailed gray scale look all the way until act two’s “Broadway Melody,” which provides such a barrage of vivid colour that the focus suddenly seems to be the invention of colour rather than the invention of talking pictures. The wooden floorboards on the stage are an ideal surface for all the tap dancing, and the thin gaps between boards facilitate the drainage of the gallons of torrential rain that flood the stage. Further technical achievements include the beautifully photographed silent and talking movies, designed by Ian William Galloway, and the hilarious scenes as the studio struggles to introduce the new technology of sound. Tim Mitchell’s lighting is an integral part of the design, with backlit panels throughout the backdrop and solidly constructed legs. Lighting is also carefully placed to maximize the visual impact of the rain. Andrew Wright’s dazzling choreography is a joy to watch, especially as performed by an ensemble of triple threats (the real kind, not the Lina Lamont variety). The choreographed overture sets a classy tone for the night, and the ensemble work reaches it zenith in the extended all-dance sequence “Broadway Melody.” Tap dancing for the lead characters reaches its peak late in act one with “Moses Supposes” for Don, Cosmo and the Dialect Coach followed by the utterly delightful “Good Morning” for Don, Cosmo and Kathy. 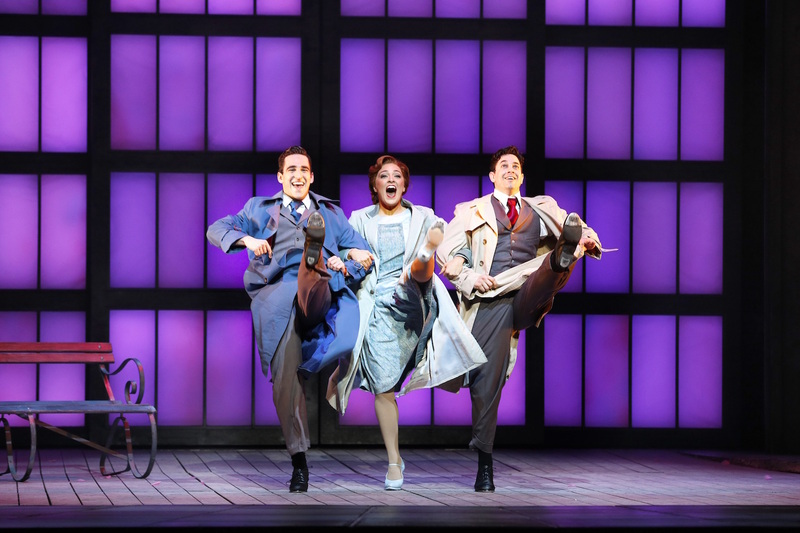 Now featured in half the musical numbers and a great many of the scenes, the ensemble is exquisitely styled in Higlett’s authentic period costumes and hairstyles. No hipsters too vain to shaves their facial fluff in this production. It’s high pants and argyle vests for the boys, and marcel waves, arched brows and cloche hats for the girls. Even the Technicolor outfits for the fantasy world of “Broadway Melody” stick to the period, with girls in a luscious rainbow of fringed flapper dresses. Dramatically attired all in black, Nadia Coote has a thrilling dance cameo in “Broadway Melody.” Also stepping forward from the ensemble to distinguish themselves in featured roles are Jan di Pietro, as the plummy Dialect Coach in “Moses Supposes,” and Lyndon Watts, who lends his velvety tenor tones to “Beautiful Girls” as Production Tenor. Maintaining a likeable stage presence, Adam Garcia returns to the Australian stage to head the cast as gregarious, goodhearted movie star Don Lockwood. Almost unrecognisable in dark henna wig, Gretel Scarlett makes a charming ingénue as starlet-to-be Kathy Selden. Scarlett sings with tender expression and, thankfully, has more dancing to do than in her last starring role in Grease. 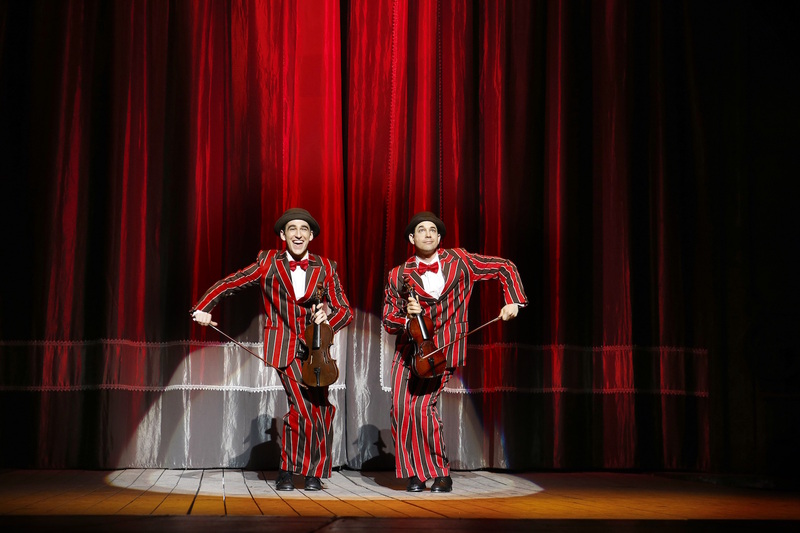 The endearing role of Cosmo Brown is a terrific showcase for Jack Chambers’ sensational tap dance skills. Chambers also rises to the challenge of providing many of the laughs as the quirky, self-effacing sidekick. These natural comic skills will only be further honed with more exposure. Cosmo’s big comical number “Make ‘Em Laugh” is an inventive highlight of act one. Erika Heynatz contrasts the glamorous looks and the shrieking vocal tones of aggressively wily movie star Lina Lamont to great effect. Heynatz is particularly funny in the sound recording scenes, and also when deftly slipping Lina’s learned pronunciation of “can’t” into the vain star’s dialogue. Ageless trouper Robyn Arthur is worth her weight in gold as celebrity radio commentator Dora Bailey and harried vocal coach Miss Dinsmore. 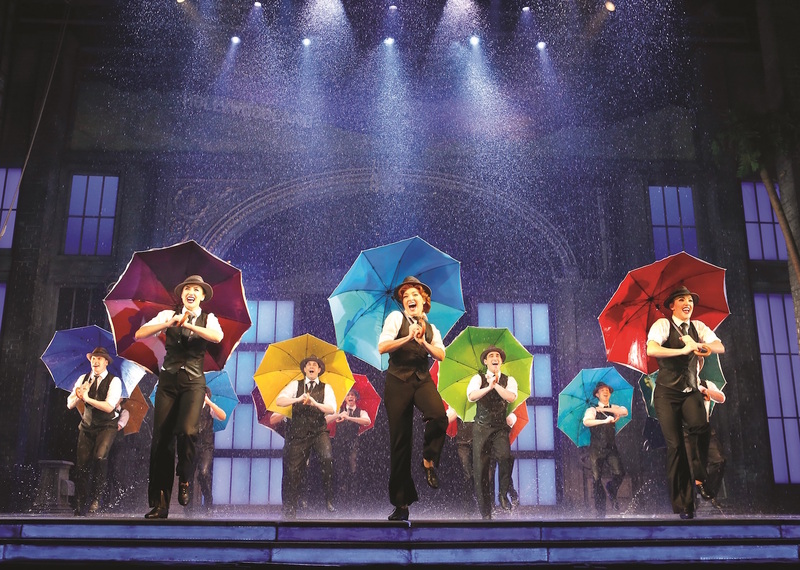 Singin’ in the Rain is good, old-fashioned music theatre fun that is sure to leave audiences smiling and humming a tune. Singin’ in the Rain plays at Her Majesty’s Theatre, Melbourne until 3 July 2016, before travelling to Sydney, Brisbane, Adelaide and Perth.